The proposed rules require companies to provide in the proxy or information statement a table and description disclosing compensation actually paid to the CEO and the average for the other Named Executive Officers. The new table would also include the annual TSR for the company and a peer group over the lost 5 years. 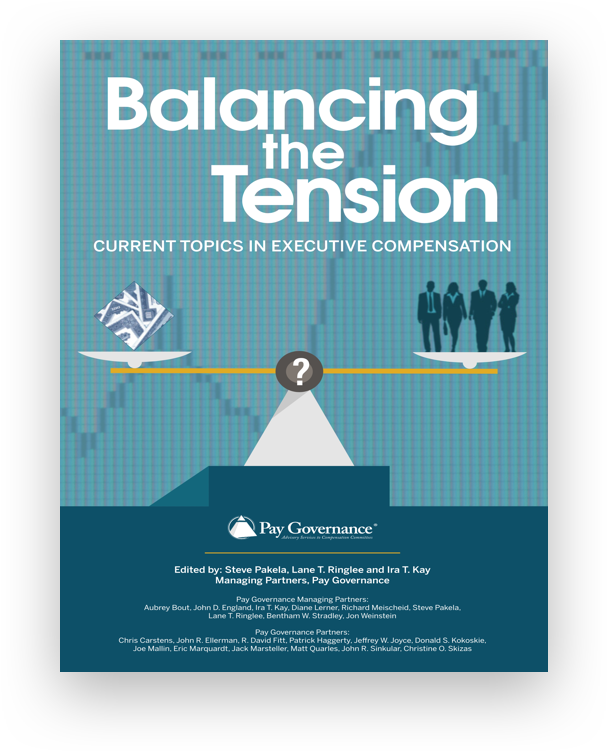 The peer group can be the CO&A-disclosed compensation peers. 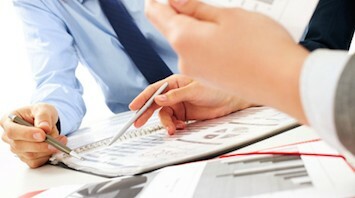 A description of the relationships between compensation and TSR is also required. "Actual Pay" as defined in the proposed regulations is a modified version of Summary Compensation Table pay: differences include stock award values based on a revaluation of equity at the vesting date and only the service cost component of the pension value. Smaller reporting companies only need to provide the comparisons for 3 years and may exclude the peer group TSR comparison. A comment period of60 days opens upon the proposed regulations publication in the Federal Register. When the SEC issued its latest Regulatory Flex Agenda (“Agenda”) last November, it disclosed that the remaining compensation and corporate governance components of the Dodd-Frank Wall Street Reform and Consumer Protection Act (“Dodd-Frank”) would be adopted by October 2015. Since that announcement, the SEC released proposed rules requiring companies to disclose whether employees or directors are allowed to hedge the market value of issuer securities. The SEC continues its delay of rules regarding clawbacks and the CEO pay ratio disclosure. 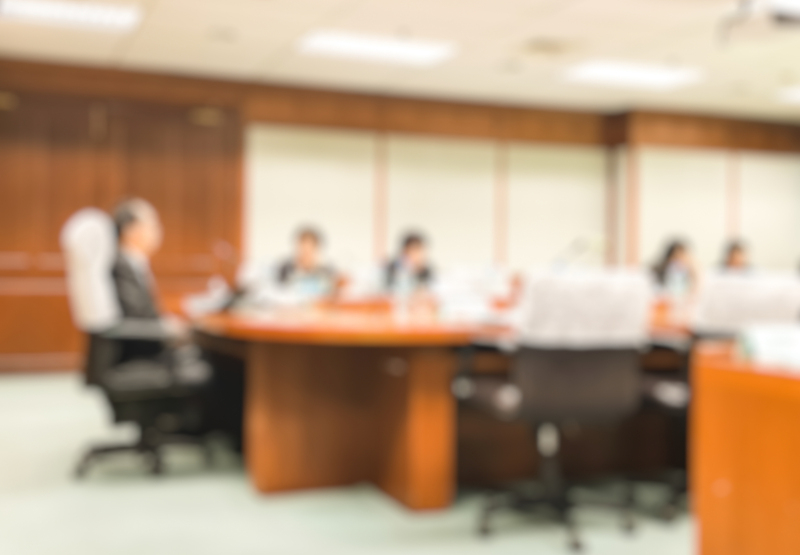 On April 29th, the SEC proposed rules for disclosing pay for performance (new Item 402 (v) of Regulation S-K) in company filings. Section 953(a) of the Dodd-Frank Act requires the SEC to implement rules requiring companies to disclose in the annual proxy or other material related to the annual shareholder meeting “a clear description of any compensation required to be disclosed…including information that shows the relationship between executive compensation actually paid and the financial performance of the registrant, taking into account any change in the value of the shares of stock and dividends…” The SEC indicates the disclosure may include a graphic component in addition to narrative disclosure. The Section refers to compensation of executives as reported in Item 402. Up to this point, many U.S. companies have proceeded to develop their own pay for performance disclosures using tabular and graphic communications of realizable pay, realized pay and other definitions of pay for performance for their CD&As. These organizations have developed their own approaches to provide an alternative view of actual compensation to that required to be disclosed in the Summary Compensation Table. However, one challenge emerging from this practice is that companies have used comparisons that are tailored to their situations, yet may not be comparable across companies. These disclosures have been customized to company metrics, peer comparisons, performance periods and methodologies. In this edition of Viewpoint, Pay Governance will discuss the proposed rules and the next steps companies should consider regarding pay for performance disclosure rules. 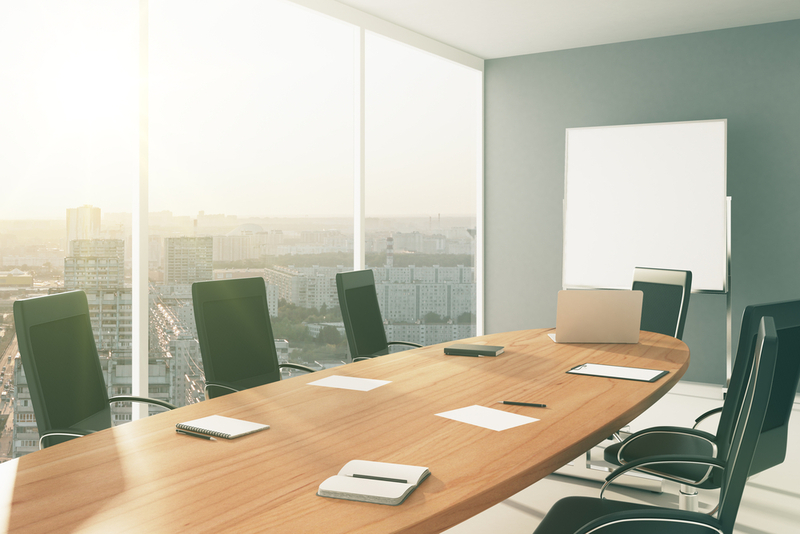 The SEC intends that the pay for performance comparison will supplement the CEO pay ratio in providing shareholders with information to better assess executive pay for purposes of the shareholder advisory Say on Pay vote. The proposed rules leave flexibility for companies to determine where this information will be disclosed. The disclosure may be provided in the CD&A or elsewhere in the proxy. Inclusion in the CD&A may imply the company has considered the information in pay-setting decisions. The proposed rules would require companies to disclose “compensation actually paid” to the CEO and the average “compensation actually paid” to the other NEOs listed in the Summary Compensation Table over the past five year period. Each year, companies will need to disclose the actual compensation paid to the CEO, as well as the average actual compensation paid to the other NEOs. The definition of actual compensation paid is an adjusted version of Summary Compensation Table pay (SCT-based pay in table below). We refer to this as Item 402 (v) Pay. For equity awards, the proposed SEC regulations would use a value recognized on the vesting date (when all conditions lapse) that is based upon the fair value of equity. Currently, values recognized on the vesting date are disclosed in the Option Exercises and Stock Vested Table accompanying other compensation disclosures in the proxy, but the disclosure includes vested stock only; vested, unexercised options are not included. Under the new proposed SEC regulations, vested options (whether or not exercised) need to be revalued on the vesting date and reported. SCT-based pay includes the change in the actuarial present value of accrued pension benefits. The new proposed SEC regulations would include only that component of change in present value of pension that is attributable to service, thus excluding the impact associated with changes in interest rates, mortality assumptions, age and other actuarial assumptions. ‍SCT-Based Pay: Compensation required for reporting in the Summary Compensation Table of the proxy, which includes base salary and bonus earned during the applicable fiscal year, plus the fair value of long-term incentives granted during the fiscal year. ‍Realizable Pay: Compensation expected to be “realized” based upon opportunities that are awarded during the performance period, but not considering vesting or exercises. Realized Pay: Compensation actually earned during the performance period based upon payments, exercises and vesting. Use of these definitions of realizable and realized pay for actual compensation was dismissed by the SEC as it considered the absence of broad agreement on the valuation methodologies to be a barrier to selecting one of these alternatives. The SEC will allow supplemental disclosures using realizable or realized pay, provided it is not misleading and not presented more prominently than the required disclosure. ‍The proposed regulations define “financial performance” as cumulative total shareholder return (change in stock price plus dividends paid and reinvested over the performance period). This is required for the company and the peer group defined by the company for each of the issuer’s five preceding fiscal years (most recently completed fiscal years). The peer group used for performance may be either the groups used in the annual report stock price performance graph (Item 201(e) of Regulation S-K) or the compensation peer group disclosed in the CD&A. Smaller company filers are only required to disclose three years of pay and performance and are exempt from the peer group comparison requirement. Actual compensation paid is to be disclosed for the most recently completed fiscal year and each of the four prior years. Using the average NEO compensation for each year lends flexibility to changes in the composition of this group over the five reported years. This time period also aligns with the current stock price performance graph required for the annual report to security holders. Compliance with the new rule will follow a transition approach requiring a minimum of three years in the first year of effectiveness, then adding one year for each successive annual filing until the five-year disclosure is reached. For smaller companies, the requirement is two years of data in the first year of effectiveness, followed by one year in the successive year so that a three-year disclosure is reached. The proposed rules would require companies to provide a table in the proxy statement including five years of “compensation actually paid” for the CEO and the average of the four other NEOs in each year. The table is to also include TSR for the company and the peer group for each of the five one-year periods. Required footnotes would provide additional disclosure on the equity awards included, the pension value included, and the peer group used for peer performance reporting. Each of the five years would comprise a row in the table, as illustrated directly below (per SEC’s proposed format). ‍The proposed rules indicate that simple tabular disclosure is insufficient to meet the requirements and that companies will need to describe the relationship between compensation actually paid (columns C and E) and company TSR (column F), as well as the relationship between the TSR of the company (column F) and that of the peers (column G). This component of the disclosure could be narrative, illustrated in a graph or both. The rules also adopt the “Plain English” requirement applicable to CD&A disclosure. ‍Misalignment of Pay and Performance Timing – the new rules will frequently report pay results as of a different date as compared to the period of performance reported. For example, most performance share plans are three years or more in length. The new disclosure includes the vesting of performance shares based on the performance period, but compares the payout with one year’s TSR results. As a result, payout and TSR performance measurement will not match. This misalignment can be exacerbated by the possible situation of a company experiencing two strong years of TSR followed by weaker TSR performance in the third year. The resultant vesting and payout will be compared only to the third year’s TSR even if the award earned was based upon above-target full three-year TSR performance. ‍Valuation of Stock Options – the new SEC rules require that outstanding stock options be valued as of the vesting date using a new valuation of the option’s fair value (i.e., present value as determined by the Black-Scholes model or other widely-accepted option model). It is our view that reporting the option’s intrinsic value at the time of vesting is a better estimate of the option’s value earned at the time of vesting than the Black-Scholes value. We do not find that Black-Scholes values have much merit when assessing pay for performance. 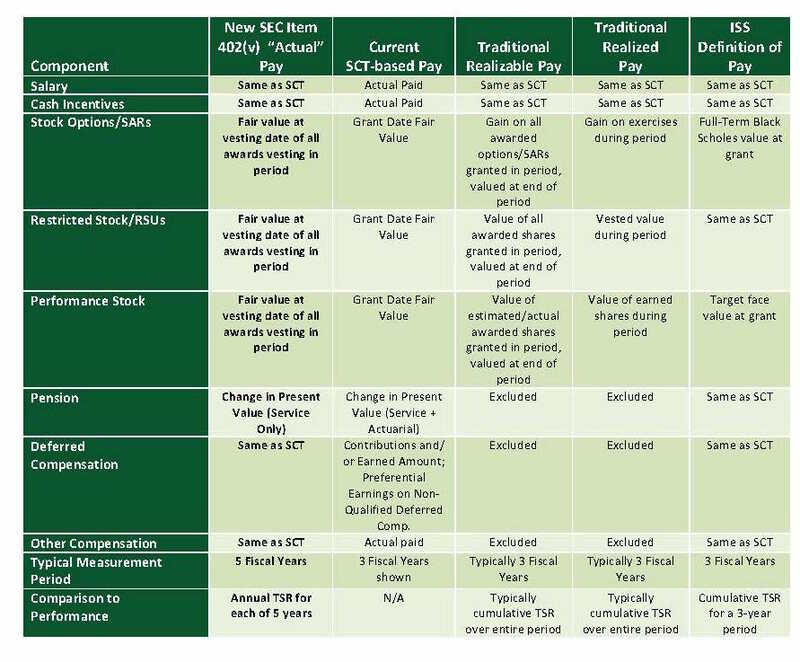 ‍Inclusion of SCT Data in the New Table – the new table required for disclosing the CEO and other NEOs’ compensation against the TSR of both the issuer and the selected peer group report both the new SEC definition of actual compensation paid as well as the compensation reported in the Summary Compensation Table. We find the inclusion of SCT compensation in this table to be unnecessary. ‍Inclusion of “All Other Compensation” in Definition of Actual Compensation Paid – it is our belief that this compensation element can be very misleading when making an assessment of total compensation earned. All other compensation is already included in the SCT compensation; including such compensation as executive relocation expense reimbursements and the service cost of pension accruals seems unnecessary. Like any new regulations proposed by the SEC, a 60 day comment period to the SEC begins upon the date of publication of the new rules in Federal Register. Pay Governance will be submitting its views regarding the new disclosure rules to the SEC in the next several weeks. We encourage companies to also make their views known to the SEC as well. It is our expressed hope that many U.S. companies and other interested parties will take the opportunity to communicate directly with the SEC about ways in which the new regulations can be improved. 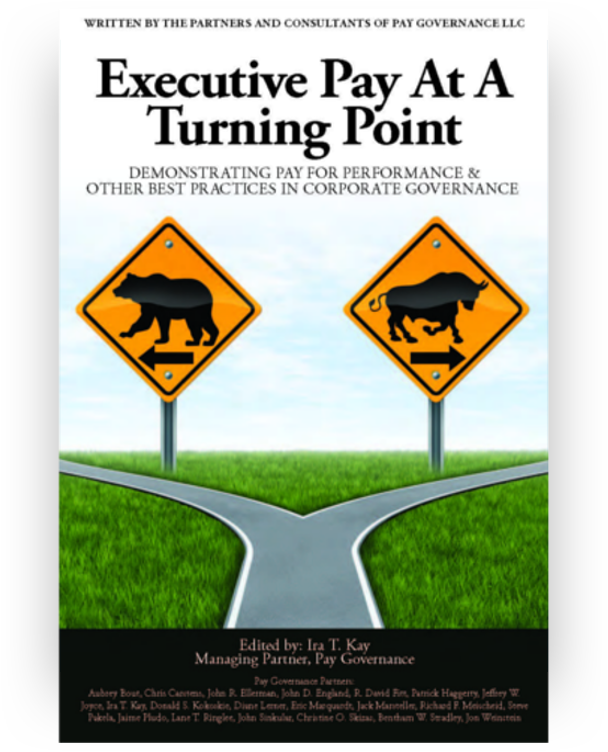 General questions about this Viewpoint can be directed to John Ellerman in by email at john.ellerman@paygovernance.com, Lane Ringlee by email at lane.ringlee@paygovernance.com, Maggie Choi by email at maggie.choi@paygovernance.com or Blaine Martin by email at blaine.martin@paygovernance.com.